High precision digital pressure gauge with an accuracy of 0.05% full scale in pressure ranges from 0…30 mbar up to 0…1000 bar. The LEX 1 high accuracy digital pressure gauge features 6 pressure units, rotatable display, zero tare & peak hold display functions and optional IECEx/ATEX approval for intrinsic safety. LEX1 high precision digital pressure gauge is a convenient portable digital pressure comparator which can be mounted on top of a calibration hand pump for high accuracy pressure calibrations. For environments with potential explosive gases, the LEX-1-Ei high accuracy digital pressure gauge is IECEx and ATEX approved for intrinsic safety. Special Features: 13 selectable pressure units , zero tare, high resolution display, plastic transit case with foam inserts. Special Options: ATEX and IECEx approved version available II 2 G Ex ia IIC T6 Gb and protective rubber impact cover, traceable and UKAS cal certificate, digital interface and logging from desktop or laptop computer. The LEX 1 digital pressure gauge is a convenient compact size measuring only 59 x 95 x 32 mm and has a battery capacity up to 2000 hours from a single small CR2430 battery. The LEX1 high accuracy digital pressure gauge has a standard accuracy of 0.05% of full scale with enhanced precision options of 0.025% and 0.01% of full scale if required. The LEX-1 digital pressure comparator utilises silicon strain gauge technology to achieve a high precision accuracy and stability of pressure measurement over time and the instrument need only be calibrated once per year as part of ISO9000 compliance to maintaining a traceable calibration standard. The LEX1 is a useful instrument for any factory maintenance or quality assurance engineer carrying out calibration of pressure gauges on production equipment. A complete selection of pressure ranges are available: 30 mbar, 100 mbar, 300 mbar, -1 to 2 bar, -1 to 20 bar, 200 bar, 400 bar, 700 bar, 1000 bar. If an absolute pressure range is chosen for the LEX 1 digital manometer it can be easily converted to gauge reference pressure by using the zero tare feature so the display reads zero pressure when measuring atmospheric pressure rather than a reading close to 1000 mb. The display features of the LEX-1 digital test gauge also include 13 pressure units: bar, psi, mbar, inHg, mmHg, inH2O, ftH2O, cmH2O, mH2O, kp/cm2 (=kg/cm2), KPa, MPa, hPa. The maximum or minimum pressure reading can be displayed in the lower portion of the display and can be reset to the actual pressure at anytime via the two push buttons on the pressure gauge front panel. For continuous use, the auto off after 15 minutes since last key press can be turned off if required for use as a process pressure gauge. For hazardous environments the LEX1 portable pressure indicator is ATEX/IECEx approved for intrinsic safety with a II 1 G EEx ia IIC T6 or T5 certification. Adapting an existing hydraulic press with a high accuracy pressure gauge to perform shear testing. What does PR, PA, PAA and PD mean? PR = vented gauge or relative to atmosphere, so reads zero when measurement port is vented to atmosphere. PA = sealed gauge reference which is fixed at 1 bar absolute (approx atmosphere), reads zero when pressure is the same as atmospheric pressure on the day the device was calibrated. PAA = absolute reference which is fixed at perfect vacuum, reads atmospheric pressure when measurement port is vented to atmosphere. You can only get positive ranges with an absolute reference, because it is impossible to have a pressure lower than a perfect vacuum. PD = differential pressure range, measures the difference in pressure between two connection points. Where exactly in the sensor is the temperature measurement taken? Does the thermal sensor measure the temperature of the gas or does it measure somewhere else within the sensor body? Is the thermal sensor measurement a direct measurement of temperature? Or is it calculated from the pressure of the gas in a fixed volume? Obviously temperature and pressure are directly related, but it is important for our application to know how the temperature is actually measured, whether it is related to the pressure of the test gas, or is entirely independent? The temperature is not derived from the gas pressure measurement, but is measured and calculated separately to the pressure reading. There is no consideration for the relationship between pressure and temperature of a gas in a fixed volume within the standard firmware. I believe the LEX1 is provided with a peak hold feature, which is displayed separately below the actual indicated pressure readings. Is the peak hold function resettable to zero at any time it is required to do so? Yes you can reset the peak store at anytime via the keypad/screen menu. We production leak test on a product where we pull a vacuum of 100mbar and hold it for several minutes. A leak is represented by a drop in vacuum, for example from 100mbar to 98mbar. How are we to apply the 0.05% accuracy in this case? For leak testing we would advise to consider the resolution of the reading rather than the accuracy. For a -0.3 to +0.3 bar range, the resolution of the display would be 0.1 mbar, so you should be able to easily distinguish a leak from 100 to 98 mbar with plenty of discrete points around the pass/fail point. We want to measure over the range of 0 to 125 psi, what will be best the range to do this? The -1 to 10 bar range will also read in psi over the -14.5 to +145 psi range. When using the LEX 1 for leak testing, should we expect the live reading to fluctuate by 0.05% throughout the test time? 0.05% is the overall reading accuracy, which in terms of leak testing, should be consider extremely stable and repeatable. This means that a given point or over a narrow section of the pressure range there will be no noticeable change in reading. The accuracy of the instrument is made up mainly by the hysteresis error, short term repeatability following a pressure cycle, and temperature errors, none of which would be expect to come into play during a leak test in a stable or controlled test environment. Does the LEX1 come with a declaration of conformity? The last page of the manual includes a declaration of conformity, which is located with the calibration certificate inside the lid of the instrument’s carrying case behind the foam inset. For your stated long term stability, how long is this test done for? Long term stability is an indication of what might happen over a period of one year, so readings should not drift by more than 0.1% FS over a 12 mth period. I’m looking for a pressure gauge with a 1/4 NPT male fitting to measure 0-30″ WC on LP gas to monitor highest pressure with a tattle tale? The closest standard range LEX 1 pressure gauge would be the 0.3 bar range which is equivalent to 120″ WC. The LEX1 includes inH2O pressure units which are the same as “WC (inch of Water Column), and you can continuously display the maximum reading in the lower portion of the display. Is it possible to measure the vacuum pressure and positive gauge pressure? Yes, the -1 to +2 bar LEX1 pressure gauge measures both positive and negative gauge pressure. This type of pressure range is called a compound range. Does the LEX1 pressure gauge have a gauge pressure range? As standard the LEX1 is fitted with absolute ranges which can be easily adjusted to read zero at atmospheric pressure. It is possible to provide non-standard vented gauge reference ranges which will track with atmospheric pressure changes without the need to continually adjust the zero reading on the display. I would like to use the LEX1 digital pressure gauge to measure 0 to 2 bar relative rather than absolute or sealed gauge, is this possible? Yes, it is possible to build a special range of 0 to 2 bar gauge where the reference side is vented to atmosphere. What is the maximum possible pressure range for the LEX1 precision pressure gauge? The highest standard measurement range for the LEX1 is 0 to 1000 bar (~15,000 psi). I would like to purchase a digital water pressure gauge that can measure 0cmH2O to 100cmH20? The LEX1 can be easily configured by the user to read in cmH2O pressure units, and the -0.3 to +0.3 bar (~300 cmH2O) range is the closest standard range. Can the LEX1 digital pressure gauge measure in cmH20? 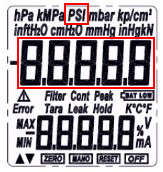 Yes, as long as there is sufficient display digits for the required pressure range, you will be able to select cmH2O (centimetres of water column) pressure units. I am interested in a digital manometer for the pressure range -1 bar to +1 bar or a range that includes this. It appears that the precision pressure gauge LEX1 would do this. It is important that the gauge be able to attach to a PC via a USB connector. If a gauge that reads the pressure in torr is available, that would be ideal, but readings in millibar would also be ok. Yes a LEX1 -1 to 2 bar range would work over this range. The PC software and the LEX1 display will allow you to select mmHg (millimetres of Mercury) units which can be treated as being identical to Torr units. The difference is only important if you want to be super precise which is well beyond the capability of the LEX1). It is also possible to read in millibars by selecting the equivalent hPa (hectopascal) units. 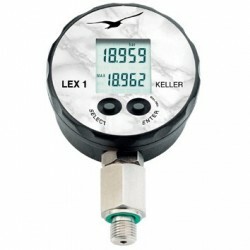 What is the size of the digital display for the LEX1 high accuracy digital pressure gauge? The LCD part of the display is ~30mm x 30mm and the reading digits are ~8mm high, the overall diameter of the gauge head is 76mm. We are looking for a manometer with an accuracy of at least +/-3 mbar, what is the accuracy of the -1 to 2 bar range LEX1? The accuracy of the LEX1 is 0.05% full scale including temperature errors form 10 to 30 degrees Celsius. Therefore a -1 to 2 bar range will be accurate to +/-1.5 mbar. We are looking for pressure gauge to test our products and determine the performance curve with the gauge. We found one product which is the model lex1 which may match our requirements. Please could you assess the suitability of the LEX1 digital pressure gauge to meet the following requirements, which are to measure over 1 to 15000psi, sample pressure at an adjustable rate of between 1-3 seconds, output the data to a PC and measure to an accuracy of better than 0.1%FS. The LEX1 has a measuring range capability up to 1000 bar which is approximately equal to 15,000 psi. If connected to a PC to log real-time data, the LEX1 can sample pressure readings at a minimum rate of 30msec (30 times per second) and is adjustable to any period between 30msec and 3 seconds or higher if necessary. There is a optional USB or RS232 interface package which includes software for storing readings on the PC and analysing the data. The LEX1 is high precision pressure gauge and measures pressure within a 0.05% FS (7.5psi) accuracy. We are looking to purchase the LEX1 high precision digital pressure gauge but we need it to go up to 3000 psi. Is this range possible and how many decimal points will the gauge be able to accurately measure within? Yes, it is possible to supply a range up to 3000 psi. The LEX1 is available with a standard range of 200 bar which is approximately equal to 3000 psi. 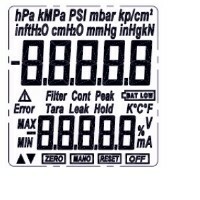 The displayed reading can be converted to 13 different pressure units which includes psi. The uncertainty accuracy is 0.05% full scale, so a 3000 psi range will be accurate to +/-1.5 psi. However the reading resolution will be 0.1 psi because the display has 5 digits. So the although the display resolution is 0.1 psi the overall accuracy is 0.25 psi. 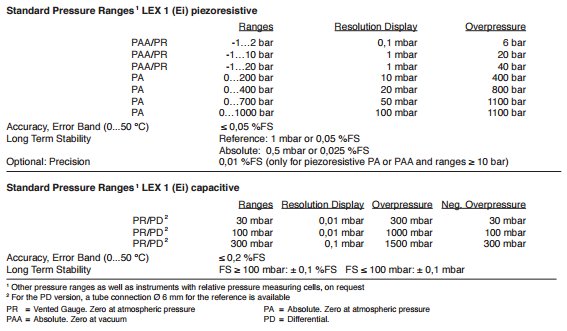 How can we get a precision of 0.01 %FS for the LEX1 highly precise digital manometer with a -1 to 2 bar range? There is an optional improved precision of 0.01 or 0.025%FS for the LEX1 but it is only available for ranges 20 bar and above and therefore only the standard precision of 0.05% FS is available for the -1 to 2 bar range. Can the LEX1 digital pressure gauge be used to work in parallel with a dead weight tester and can it read the corrected geographical values? Yes the LEX1 can be used in conjunction with a dead weight tester and will measure pressure completely independent of geographical values (local gravity). The pressure generated by a dead weight tester is affected by the variation in local gravity at different locations. The basic principle of a dead weight tester is to place a known mass on top of a piston cylinder assembly, which under the influence of gravity, pushes the piston down to produce a pressure. A pressure gauge measures the pressure via a diaphragm that is designed to flex with changes in pressure. The diaphragm movement is detected by attaching a mechanism with either a moving dial or an electromechanical device integrated with a digital readout. None of the components used rely on the interaction with gravity to measure the pressure. I am interested in what the LEX1 logs using the software, how it connects to a PC? Using the supplied PC software, you can plot pressure, temperature against time, and view a table of the results when a logging run is saved. The data saved can be exported to a spreadsheet. The USB interface cable plugs into the back of the gauge via a Fischer mating connector. Does the software automatically display the max pressure reading for a given run, or would that need to be found manually? The LEX1 stores the maximum and minimum reading which can be shown on the LCD display, but if you are using the software you will have to determine the maximum pressure manually by examining the data. Does the software create a report with the readings? The CCS30 software does not have a specific report mode but the screen will display a lot of information about the device and the collected data which you can save to “print screen”. Also the CCS30 software allows you to export the tabulated data for importing into a spreadsheet. When connecting the LEX1 precision pressure gauge to the computer and running the Read30 software to record pressure readings, I noticed that the data only changed every 0.5 seconds even though the software was selected to record a new value every 20 msec. Can you explain why this is happening please? There was an update to the LEX1 firmware, a LEX1 with the old firmware will only send a reading every 0.5 seconds. If the readings are fed out via the USB converter cable at a faster rate it will display several times the same value until the next updated value sent from the LEX1. A newer LEX1 with the updated firmware will process a reading request faster in about 30 milliseconds. Therefore the pressure gauge you tested must have the older firmware. You are able to set a faster rate in the software but the recorded interval will be limited to the minimum possible for each device connected, which in your case is 0.5 seconds. What is the minimum update time for recording each pressure reading when the LEX1 high precision digital pressure gauge is connected to a computer and running the Read30 software? There are two updates rates to consider when connecting the LEX1 to a computer, the measurement rate which is controlled by the LEX1 firmware and the communication rate which is controlled by the Read30 software installed on the computer. The LEX1 has a minimum measuring rate of 40Hz (25 msec period), but the communication rate is limited by the Read30 request and answer process which takes a minimum of 30 msec with a 9600 baud rate. Is it possible to use the Keller LEX1 digital pressure gauge for water pressure measurements? Yes, the LEX1 is compatible with clean fresh water, the component materials which will be in contact with the water are stainless steel 316L for the diaphragm and pressure fitting and Viton for the internal and external pressure seals. Is the LEX1 digital pressure gauge compatible with Landing Gear Fluid? The LEX1 has a stainless steel 316L pressure port and diaphragm with Viton O ring seals, which is compatible with mineral oil, but not with Aviation hydraulic oils such as Skydrol or other Phosphate Ester based fluids, since Viton has poor compatibility. What thread size does the LEX1 digital pressure gauge come with? The standard thread size is a G1/4 male which is also known as a 1/4 BSP P male. We recently purchased a LEX1 high accuracy pressure gauge and we believe the one we have received has a G1/4 male fitting. However, we require 1/2″ NPT male fitting for connection to our equipment. Is there a part that we can purchase that will adapt the G1/4 to a 1/2NPT? Yes that is correct, the LEX1 is provided with a G1/4 male thread and captive seal as standard. For converting to a 1/2 inch tapered thread, there is a G1/4 female to 1/2 NPT male adapter available and the part number is 506810.0007. How do I align the digital display for the LEX1 precision pressure gauge when connected to a PGS40 calibration hand pump? At the bottom of the gauge housing where it joins with the metal stem, you will notice a hexagonal locking nut which when tightened prevents the plastic housing from rotating. First mount the pressure gauge on top of the pump and gently tighten the hexagonal shaped metal stem to the head of the pump to provide a sufficient pressure tight seal. Then, whilst holding the plastic housing, loosen the locking nut at its base so that it can be rotated to the optimum position and then re-tightened. Inside the pressure gauge there are electrical wires that connect the digital display to the pressure sensor in the stem, so be careful not to over-rotate the gauge head. Why is there an option for the LEX1 to be supplied with a calibration hand pump, does the gauge not come accurately calibrated? The calibration pump is not needed unless you intend to use it with the pressure gauge to test other pressure instruments. As standard the LEX1 test gauge is supplied with a traceable 5 points max calibration certificate as standard to verify the accuracy specification. Do you have a portable calibration test kit for use with the LEX1 precision digital pressure gauge? Test hand pump with -1 to 40 bar for pneumatic pressures and 700 or 1000 bar for hydraulic pressures. Complete set of BSP and/or NPT adaptors for connecting the pump to the device under test. Large transit case with foam inserts for storage and transportation. What is the ATEX IS approval option for the LEX1 precision digital manometer and for what is it necessary? ATEX is the European directive which controls the use of electrical equipment in potentially explosive environments such as petrochemical refineries for example. So you only need this option if you are going to use the pressure gauge in a zone which is designated as a hazardous area and will only accept instrumentation certified to II 1 G EEx ia IIC T6/T5 or less. Is the LEX1 precision pressure gauge supplied by default with a protective case? Yes the LEX1 is supplied in it’s own small plastic carrying case with foam inserts. There is also the option to include a rubber boot to protect the gauge when in use and a soft carrying case for attaching to a tool belt. I am looking to read the air pressure in the range of 1000mbar +/-200mbar, so +/-200mbar around atmosphere, with the highest possible accuracy, but which model would you recommend? We would suggest a -300 to +300 mbar gauge range LEX1, since a gauge reference range measures relative to atmospheric pressure, plus the LEX1 is a high accuracy pressure gauge with a high resolution display. We are looking for a pressure gauge that can measure both positive and negative pressure (-15 psi to 30 psi) that also has real time data logging capabilities. The LEX1 will read from -15 to 30 psi, and you can use the provided USB interface & software to log in real time on the PC. For a 400 bar version of the LEX1, how low a pressure can you read? This version is designed to be used over the range of 0 to 400 bar, but bear in mind the overall measurement accuracy is 0.1 % full scale and the reading resolution is 50 mbar for the front panel display, and 10 mbar via the digital interface. We want to use a pressure gauge for air tightness testing of our marine electronics. We do real water ingression test but before the real water ingression test, we do a positive air pressure test and vacuum test to filter out bad testing samples. We are looking for a higher accuracy resolution gauge with less than 1mbar resolution, and preferably 0.2mbar resolution, to operate over a low pressure range of -150mbar to +50mbar. A -0.3 to +0.3 bar LEX1 would be the closest match to your requirements and this range will have a display resolution of 0.1 mbar. I want to replace a 10 bar analogue gauge used as part of a pipework pressure testing kit with a digital pressure gauge with a higher degree of accuracy when used for leak detection applications. The LEX has a 0.05% Fs accuracy at room temperature and display resolution of 1 mbar. 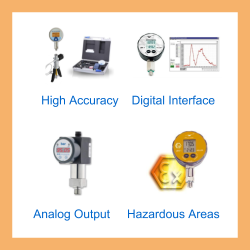 Please select the options you require for the LEX1 (Ei) High Accuracy Digital Pressure Gauge in your application and request a quote. Send us your enquiry for LEX1 (Ei) High Accuracy Digital Pressure Gauge to get assistance with this product type.